CoreOS announced Tectonic 1.8, its latest update of the popular Kubernetes container orchestration tool. It features a new open services catalog that enables DevOps personnel to plug in external services into Kubernetes with ease. As Rob Szumski, Tectonic product manager at CoreOS pointed out in a company blog post announcing the new version, public clouds offer lots of benefits around ease of use, but they can end up locking you in, in some cases to a proprietary set of tools. This is precisely what the new Open Cloud Services catalog is designed to resolve. Instead of using those proprietary tools, you get more open choices and that should make it easier to move between clouds or a hybrid environment. “New for Tectonic 1.8, CoreOS Open Cloud Services offer the same near-effortless operations customers have come to expect from managed cloud offerings with a difference. Unlike proprietary cloud services, Open Cloud Services are first-class, fully automated Kubernetes resources running on the CoreOS Tectonic platform,” Szumski wrote in the blog post. CoreOS is aiming to keep the whole process as open and portable as possible, so that customers can choose where and how they want to deploy their applications. What’s more, the Open Cloud Catalog is built right into the Tectonic console, making it simple to enable the external services (or disable them as you choose). 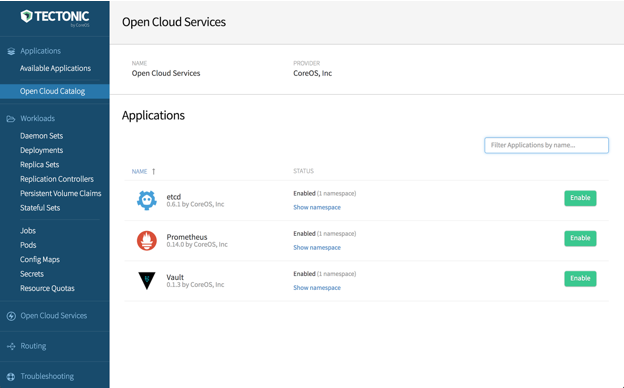 Among the earliest additions to the Open Cloud Services offering are etcd, Prometheus and Vault. The Open Cloud Service Catalog was only part of the Tectonic 1.8 release, which puts it in line with the open source version released at the end of September. As CoreOS points out, this is a pure upstream version of Kubernetes, meaning it’s not a fork, something the Cloud Native Computing Foundation, the organization that manages the Kubernetes open source project has been striving for from members. It will also automatically update the Docker container engine, which developers use to create the containers that make up an application. Operations uses Kubernetes to manage and deploy the containers. That means, it’s taking care of both sides of the container DevOps equation for you. The latest version will be shipping towards the end of the year and the company says it will be a smooth and automatic update from Tectonic 1.7 for existing CoreOS customers.